It might be shameful that it took me "so long" to read this book. However, I'm not a native Oregonian so perhaps that has bought me some time. Since arriving in this beautiful state I have come to appreciate and love it. (Not the politics of it, mind you, just the beauty.) I see copies of Bound for Oregon around and about but I've not picked up a copy to read for myself until very recently. I decided it was high time and I'm glad that I didn't wait any longer to read it. 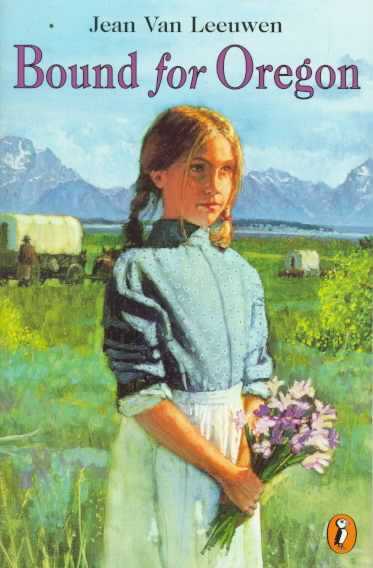 Given the fact that the Bookworms and I have been discussing life in the Wild West and I've been reading up on travels by covered wagon, Bound for Oregon made for a very fun mommy read. It tells the story of the Todd family as they make their way from Arkansas to Oregon in the 1850's, when the country began making rumblings about the issue of slavery. Although President Lincoln is discussed, this is a really brief side note to the story. Most of the story involves the dangers, adventures and triumphs of the Todd family. Bound for Oregon is based on a true story of the real life Mary Ellen Todd. Mary Todd loved to tell stories of her family's travels west to her own children and her daughter, Adrietta Applegate Hixon , eventually wrote her mother's stories down. She published these stories under the title On to Oregon! A True Story of a Young Girl's Journey Into the West! and it was discovered by author Jean Van Leeuwen. Leeuwen took those stories and added some dialogue, history and elaboration and gave us Bound for Oregon . Reading about the Todd's adventures makes my own cross-country trip to Oregon (I decided to make a big road trip out of my move and drove from TX to FL to MD and then took off for Idaho and Oregon.) seem like a breeze. My trip lasted about 1 week. The Todd family took 6 months. My trip did not involve being surrounded and once lassoed by Indians. But we both had problems getting over the mountains! (I had never heard of the concept of resting your vehicle to give your breaks a rest! I thought my little hatchback was the Energizer Bunny or something.) I did not have to leave anything on the side of the road and I did not pass any unmarked graves (that I know of.) I slept at B&B's and ate in restaurants. The Todd cooked their meals over buffalo chips. I barely had a sniffle and their family suffered in the middle of a cholera epidemic. Their livestock barely made the trip and possibly my hatchback barely made it also. But it managed to survive for a few good years beyond the move. In the end though, both the Todd family and myself ended up in the exact same location (they ended up about 45 minutes north of me) and we both fell in love with the land. The promise of green beauty, calm weather, fertile land, and amazing opportunities are still as true today as they were back in the 1850's. Yes it rains. But that keeps the grass green and the produce nice and healthy. My mother-in-law once referred to the area that we live as the "Garden of Eden" in the summer time for all the yummy, delicious and fresh food that is grown here that we get to partake of. It is beautiful and wonderful and I do very much love it! It goes without saying that I really loved this book as well! If you live in Oregon, I would say it is a must read! You read and find the family's struggles and sacrifices interesting as they move further west. When they hit Oregon and the Dulles you can visualize everything and it makes the read all the more fascinating because you know where they are headed and you know that it is good. If you don't live in Oregon but are doing any kind of unit study on traveling west by covered wagon, Bound for Oregon simply must be included in your lesson planning! Jean Van Leeuwen did a great job at bringing history to life and I found myself cheering the Todd family on as they traveled day by day to come to this land that I love. Very fun book! Well worth the time. I am so glad to have a copy for our family to enjoy in the future. Oh, what fun to find a book that "parallels" your own journey and one that you can share with your bookworms. I just read this for our homeschool group and loved it too. Thanks for highlighting it. How fun it must be to be able to visualize their destination! Our older students also read The Stout-Hearted Seven. It's a true story of a family moving to Oregon, as well as the Whitmans, missionaries to the Indians in Oregon. It's a sad read but since it's a true story, it was very challenging to me. Both stories encouraged me to be more stout-hearted! This looks like a book my girls would LOVE!! Thanks for the review. The author's name is so familiar to me, too. I wonder what else she has written. . . I love the way you related to the story and compared it to your own journey west. I hope to one day visit Oregon. what are the four most important things in the book Bound for Oregon?